Ugh. What can I say about the above picture? That is our patio furniture. Full of stains, rips and other lovely things like bird droppings. To say our patio needed a makeover was an understatement. Here is the entire set. It is pretty boring and totally does NOT match my personality. I want something fun! I decided to see what Kmart had to offer and was pleasantly surprised! 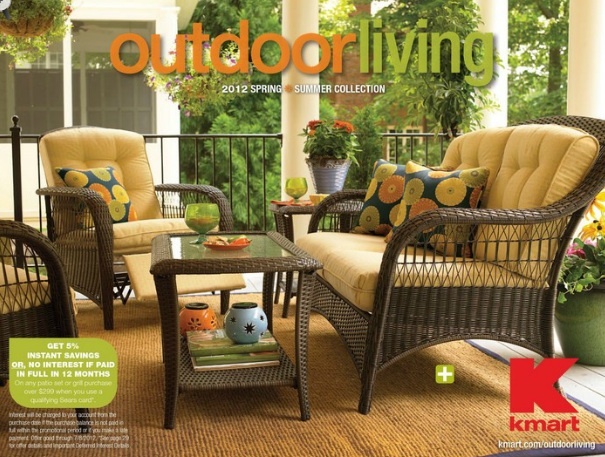 They make it easy and offer an online catalog, they also offer online layaway! Since the nearest store to us is nearly an hour away it is nice to have so many online options! I was able to pick out what I wanted without even leaving my house! I could also see what was available at the stores near me so I would not be making a wasted trip! That was GREAT! I decided to get some replacement cushions for our patio chairs and put them on layaway. I love using layaway because it allows me to make payments over time rather than coming up with the money right then! Kmart offers online layaway that allows you to place items in layaway at your local store from your home. During the process they show you how much your payments will be and when they are due. Super easy! To learn more about their awesome layaway options, check out their website. Basically, you add your items to your cart and click a little box if you would like to include the item to the online layaway. When you are ready to check out, you are given your total and asked to pay a small fee of $5 and your down payment. For most purchases the down payment is $15. You then have the next 8 weeks to pay off your balance. I could not wait to get my cushions so we decided to go the next day! Hubs and I loaded up the girls and off we went! I stumbled upon this chair and decided I HAVE to have this after we are done with our entire makeover. Yep, it's a LAZBOY! At Kmart! So awesome! We walked around for a bit and purchased a few extra's to pull everything together. At checkout we used our Shop Your Way Rewards Card and received a $5 gift card to use on our next purchase! AWESOME! To see my entire path to purchase, check out my Google+ album! Here is our spruced up patio! I LOVE the colors! I painted the plant stand and candle holder to match our table and chairs. We also decided to hang the candle in the plant stand rather than the plant and I think it looks GREAT! I LOVE everything we purchased and have spent a LOT of time outside this weekend. Revealing the makeover to hubby and the girls was really fun, I can't wait to reveal it to the rest of our family and friends during our Memorial Day celebrations! Excited to get your patio ready for Memorial Day? Check out these great deals THIS WEEK at Kmart! To see even more great deals, check out this weeks ad here! I am a member of the Collective Bias™ Social Fabric® Community. This shop has been compensated as part of a social shopper insights study for Collective Bias™. #CBias #SocialFabric All opinions are my own.